How are you? I hope all is well. I wanted to give you the latest on Mac! We’ve been doing some work with the pigeons and it’s been going well. The real deal was the past weekend though! I think I mentioned to you last visit that I joined Warriors Mark. It’s been a great move thus far. 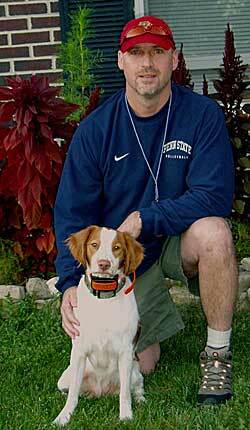 One of the benefits is taking Mac over to train on the grounds. This past Sunday, I took her and my buddy over for some training. We got 6 Chukars and released them around the field. I worked Mac and he shot. Mac found and pointed all of them – at least 3 of which were “Rock Steady” points!! It was awesome! Even my buddy (who is pretty hard to impress) was impressed!! The last one was off the check cord as well and my buddy only winged it. Mac did a nice job tracking it down in some deep grass and also retrieved all of them – some better than others but all eventually got back to me! So…I wanted to let you know and wanted to thank you again for all your time and expertise. I can’t even begin to tell you how much I appreciate it! Please stay in touch and best wishes to you and your family. Things with me and Mac are going really well. We’ve had a very good year hunting – especially for her first full season. Last weekend was the best though. 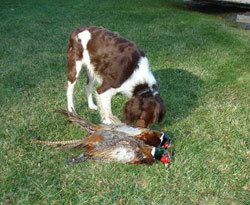 We went over to Warriors Mark and she was amazing – pointing everything – chukars, pheasants! It was by far her best day to date! I still can’t thank you enough for all your advice and help with her! Just wanted to let you know that the little monster is doing very well. My German shepherd and Remmy are attached at the hip. The play/fight all day and I was surprised how much abuse Rambo will take from the little guy, and he is still very gentle. Remmy is already starting to point small birds. I am going to give him a couple of more months and we will start training. I’ll keep you up to date. I have to tell you that was the best $600 that I have spent in a long time. I’ve had Remmy out three times and he is hunting. 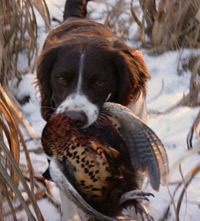 He stays on point without flushing, follows the bird in the air, retrieves the bird (chuckars) and drops it at my feet. He over came the shotgun blast the first day out. He has had no formal training as of yet and it doesn’t appear that he will need it. His registered name is Rock Steadys Remington Rocket, as you requested. I am very proud of Remmy’s hunting ability for being 7 months old. I had him out the other day and he was non stop hunting for the whole time we were out. 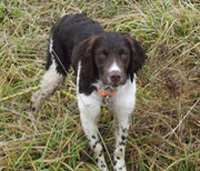 He actively seeks out pheasants, points and retrieves. I don’t have to fight him for the bird. He drops them at my feet. He is a natural. All he wants to do is hunt. At this rate I am pretty sure that I will be guiding him out next season. Outside of his puppy chewing issues (which we are working on) he is a wonderful loving dog. If I would have known that he was going to be this good, I would have paid twice the price. Just wanted to let you know that the monster is doing awesome. I started doing some work with a trainer but he doesn’t think he will need much. His hunting drive is nonstop. I’m going to guide him out with friends to make sure he is up to speed and if he does well I think I can secure a spot on the ring neck ridge team. Any way the Monster is so damn loveable and quite the smoocher. He has grown quite comfortable running in the Endless Mountains. I just wanted to let you know that I got to guide out Remmy this past winter at Ringneck Ridge Preserve. He was a big hit and everybody loved him. Believe it or not I have had several requests for him as the dog of choice. The both of us started out together with no skills or experience but our motivation and his instincts have taken us farther than I expected. I’m sure having great bloodlines had something to do with it too. Hopefully but the end of May Remmy should have his Junior Hunter Title and then we can start preparing for the Senior Hunt tests in the fall. We now are working on his steady to wing and shot and he is making good progress. He is a quick learner and wants to please. He will hunt until he has nothing left in the tank. How are all of you guys doing? Gunner is doing good. He’s starting to get the hint that he shouldn’t go to the bathroom in the house. He really is a great dog. He seems a little bigger from when we first got him. He likes to play with the baby. He’s very playful around my mother’s two German shepherds. He actually scares one of them away and he’s a quarter of the size. I’m interested in getting another one. When do you guys think you will have another litter coming up? 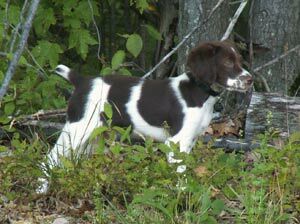 Is it hard to train him to be a hunting dog and what would I need to do, and get, to train him? Just a note to let you know that the pup we got from you 3 years ago this fall is a great dog. The best Brit that we’ve owned, and he is our fourth. If you need a reference in the Ithaca area, please feel free to call on us. 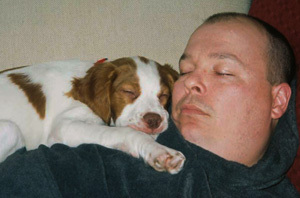 Again, thanks for producing GREAT dogs and the best to you. Just a quick note to let you know that Molly is doing great. I have had her out hunting a few times and she is performing well. Thank you Mark and the rest of your family. There is never a dull moment with Molly around. A Great Molly retrieval story for you as long as I have your attention… Let me give you a picture of the setting… ‘Its late season pheasant hunting (Dec. 29th to be exact) in SD. There is about 14″ of new snow on the ground, most of it falling on the day after Christmas. It’s a fairly nice day though… if I recall correctly sunny and about 25 or so. The birds were very skittish and we had been struggling to get any close shots the whole week. We stopped at a large canary grass patch that I had hunted the previous trip. I figured there would be birds in it and the anticipation was intense. Stop the vehicle…hunters out, dogs out, Oooh!! look the birds are already flushing approx. 300 yards away. After a short sprint to the edge of the grass I was able to pick out a nice rooster. A long shot but I was confident in my shooting, yep one down bird… but not hit well. Ok. The dilemma… The two dogs and the other two hunters decided to hunt the other side of the road; this means no dog for me! A quick call to Molly and within seconds she was by my side, and within another second no where to be seen. This grass was thick, 6-8 feet tall, and leaning over because of the snow and ice covering it. I went over to where the rooster should be laying but found nothing. I searched the area for 10-15 minutes to no avail. The other two hunters along with my other dog (with nothing in their bag) came to help me look. We looked for another 10 minutes or so and still nothing not even Molly. We decided to walk back to the road and wait to see what was up with the lost dog. Out comes the whistle along with a few calls to Molly………whistle….NOTHING….wait a minute, I think that’s her coming sideways, yes sideways, across the stubble cornfield approx 1/4 mile away! Well it turns out that it was her and she had the bird with her in her mouth. The reason it took so long for the retrieve was because the bird was still alive and had his wings flapped over her eyes. Molly was retrieving by the sound of my voice and the whistles. She would stray off course if I would stop calling and eventually stop and wait for the next sound of where to go. We got Molly and the bird back with a few good chuckles. Watching her walk sideways and have no clue what direction she was walking was comical. It was an amazing site! I see the guys that I was hunting with quite often and this story seems to come up almost every time. I just want to note that this rooster had the longest tail feathers of all of the birds that I have taken. He is now spending some time at the taxidermist. I hope you have enjoyed this story! I know that I do! Oh yeah and one more note: I can tell she came from a great bloodline cause she sure learns things quickly. Mostly good things but she has her mischievous times as well. She’s awesome. Rueger had a good night, his ride was great he sat on the back seat and put his head between me and Bob on the console. 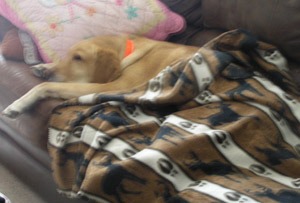 He has learned that when he goes out and relieves himself, he gets a treat when he comes back in. He will sit on the floor and wait for it to be opened. He has also learned all about kisses, loves to get them and give them. He is laying here on the floor at my desk. Will send pictures as soon as we take some. Thank you for all of your kindness, we love having him as part of our family. 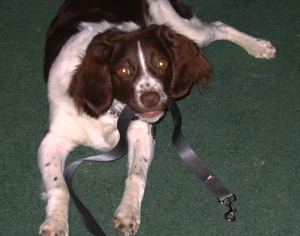 Here are some pictures from 8-16-06 of Benny’s 1st official outdoor training. Got some wonderful retrieves and an awesome point on a hidden pheasant wing. Additionally, he is great to walk with as we have brought him to the local archery club at least once a week and he is naturally a close working dog and we have never had an issue with him getting too far out. Vet is pleased with his health and disposition. This is Jim Kelley. I bought puppy #6 (Chuck). He is doing very well with his yard training. Today we put him on some quail and he did great. I couldn’t be happier with him. 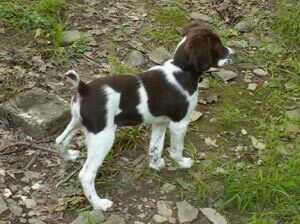 Not only has he turned out to be a great home companion, it also seems he is on his way to being a great hunting companion. Thank you for the great puppy and tell your wife and kids we said hi. I have attached a picture taken last week. Hope you like it. Benny got his first bird this season. 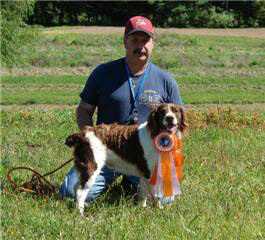 He is a natural hunter, as I got busy this fall and lacked a bit in training time. 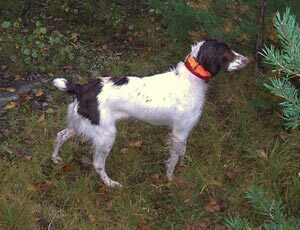 He finds the birds, quarters in the direction your gun is pointing and the one bird I did shoot he retrieved flawlessly. 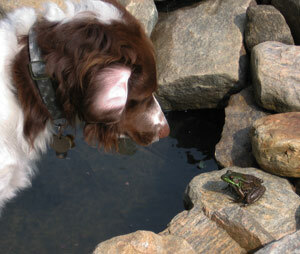 He ignores rabbits; though he did get sight of a buck and chased him, but does not scent them. Still young and working on it. 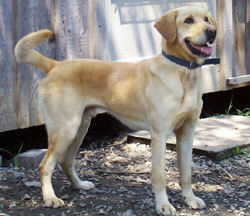 Great family dog, wonderful with the kids and definitely a loyal pet. 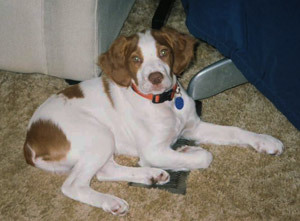 I just wanted to send you a couple pictures of our beautiful one year old Brittany, Kali. We really do love her. 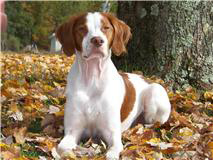 She has a great time running around, hunting, and being with people. We could not have asked for a better dog. Thanks again for giving us such a wonderful pet. Hello Mark and Shoff family! Herbie, our brit, is now 3 years old and a wonderful addition to our family! 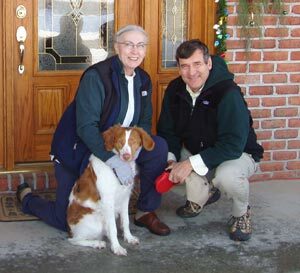 We can’t thank you enough for your great breeding practices! He’s just the greatest dog in the world-of course, you probably never heard that before.